Cradle to Cross celebrates Christ’s incarnation and then visually meditates on the cross. Each of the pieces in the exhibition is a delicate translation in line and gold, recreating specific historical works as ‘icons’ from the canon of Western Art. Cradle to Cross begins with an interpretation of Simone Martini’s Annunciation, includes a Nativity, Madonna and child, Rembrandt’s Storm on the Sea of Galilee, a Descent from the Cross, and concludes with Piero della Francesco’s Resurrection. 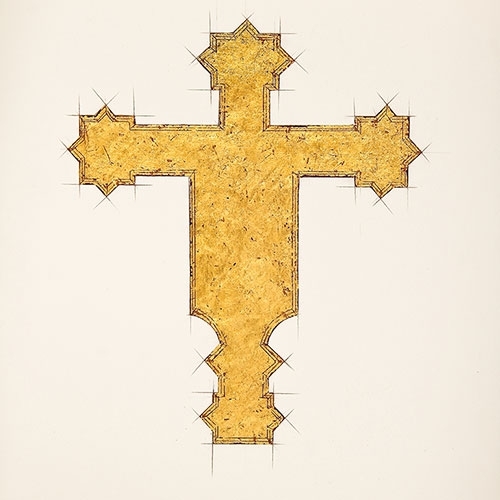 There are also several delicately drawn gilded crosses. These crosses hung above the altar in Medieval churches and when people came forward for communion, they were literally 'under the cross,' a profound concept. Via Crucis is Latin for The Way of the Cross. This term usually refers to the series of pictures of Jesus on the day of his Crucifixion. Via Crucis celebrates the early painted crosses and other art objects that depict Jesus in the events surrounding his death. These crosses hung above the altars in Italian Medieval and Renaissance churches. They actually were suspended at an angle so that when the participants came to receive the Eucharist at the altar, they stood literally under the cross—an amazing concept. This small show with its sixteen gilded crosses is designed to help rediscover its rich Christian visual heritage, of which these crosses, altars and sculptures represent only a mere fraction of the art that was created to enhance worship. 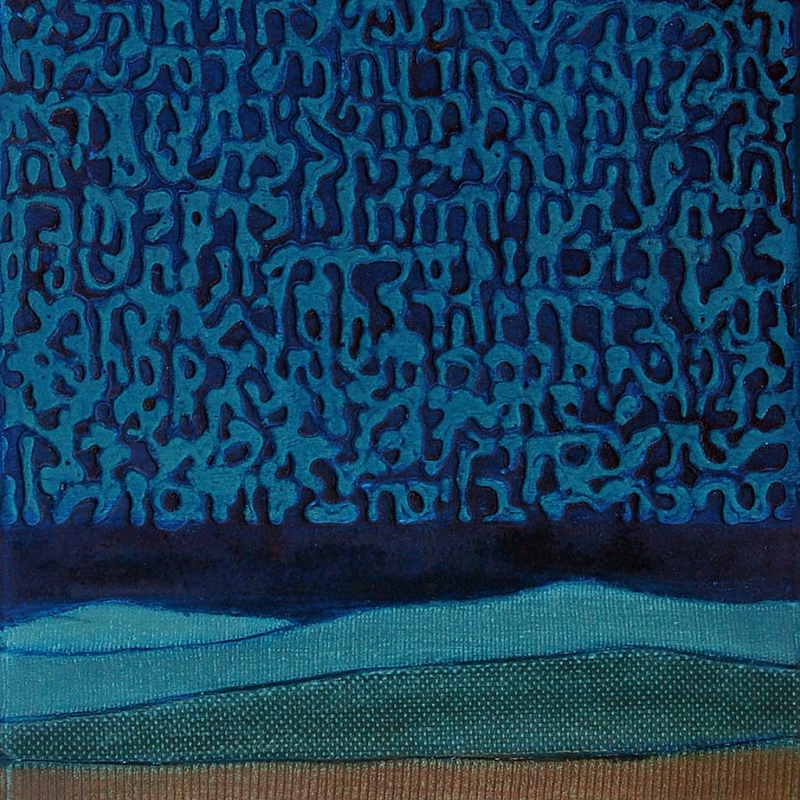 Sandra Bowden's work is a complex meditation on time, incorporating Biblical archaeological references and ancient text in her art. The mystery of the word as a vehicle of communication across generations has been an important component of her personal iconography, using segments of language and text as design within the image. Her visual imagery is a provocative example of art centered both figuratively and literally in word. She finds a source of mystery in the evolution of the word, visibly recorded and presented historically in a variety of ways. 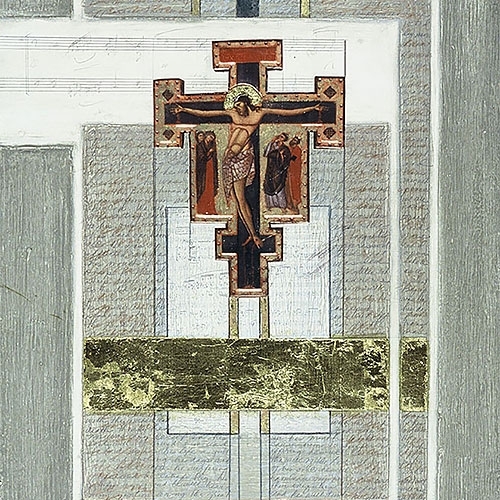 Images from her Text Series and Collage Series are included in this exhibition along with several from Bowden's Crucifixion Series. 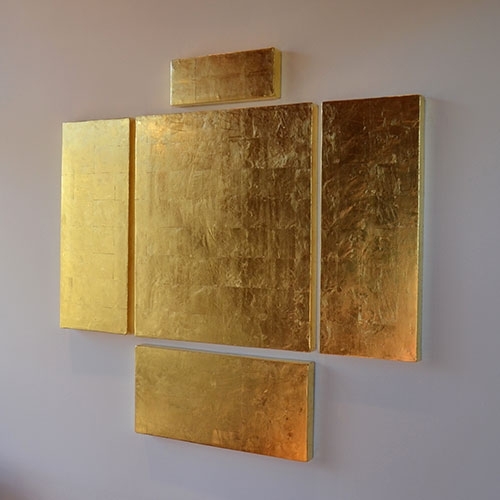 Reflecting the Glory is my most recent work continuing this conversation of connections as a way to pay homage to the “Icons of Western Art.” This show highlights several gilded encaustic panels that recall many iconic paintings from art history. 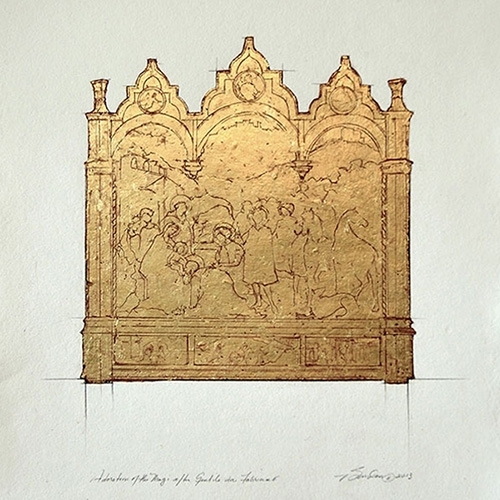 Their distinct shapes identify the historic work, but because of their solid gold surface, allow the viewer to delight in the radiance of each panel, while drawing on memory and imagination to fill in the forms.